Cherimoya, considered to be one of the most delicious South American fruits, is thought to have originated in Peru and Ecuador and has become naturalized throughout the tropical highlands and subtropical areas of South America. The spreading, low-branched trees can grow to 30 feet tall but usually are kept shorter for ease of harvest. The leaves of different cultivars and seedling trees vary a lot in shape and can be from 3 to 10 inches long and 2 to 5 inches wide. The fruit also is found in a wide variety of shapes and sizes with varying degrees of U-shaped, smooth indentations or bumpy protuberances. Cherimoyas generally ripen 5–7 months after pollination. Ripe fruit can be from 1 to 12 inches in diameter. The fruit contains numerous black or brown seeds, which are easily separated from the pulp. Usually eaten fresh out of hand, cherimoya is also used to flavor flan, sorbet, and ice cream. 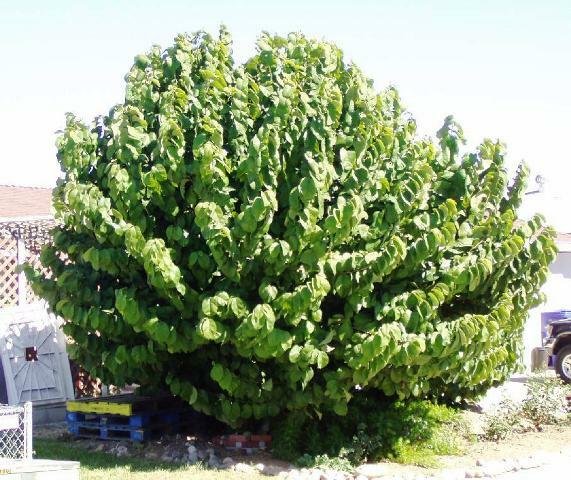 The tree is believed to have come to Hawaii in the 1790s, although fruiting trees were first recorded in 1825. By 1920 the tree had become naturalized in Kona and Ka‘ü on the Big Island. Of the many cultivars of the fruit, a few popular types are ‘Bays’, ‘Whaley’, ‘Deliciosa’, ‘Chaffey’, ‘Booth’,and ‘McPherson’. In Spain, ‘Pinchua’ and ‘Baste’ are important. In South America, popular cultivars include ‘Lisa’, ‘Impresa’, ‘Umbonada’, ‘Papilonado’, ‘Tuberculada’ and ‘Chevez’. Varieties differ in smoothness of skin, number and size of protrusions, amount of seeds, and extent of depressions in the skin. Trees producing seedless fruit are sometimes reported. Seedlessness of fruit can be induced by repeated applications of gibberellic acid. The subtropical cherimoya prefers higher elevations, to 5000 feet, but will bear fruit as low as at 800 feet. At lower elevations, however, trees seem to be less productive and the fruit is more susceptible to insect damage. Seedling trees have been planted at lower elevations in Kona in hopes that a suitable selection can be found. Generally, atemoya (A. squamosa x A. cherimola) is recommended for low elevations. Cherimoya prefers rich, loamy, well drained soil with uniform moisture. The tree is drought tolerant and does not tolerate standing water. Orchard trees are generally spaced 20–25 feet apart but can be closer if intensive pruning is practiced. Seedling and grafted plants will bear fruit in 2–4 years given proper nutrition. Shaping the young trees is important to fruit production. Limbs need to be able to support the heavy fruits, which can weigh more than 2 pounds. Usually two or three lower limbs that angle upward at about 60 degrees from the trunk are saved. The pruning style adopted in many production areas is called the open goblet. Prune during the rest period when leaves begin to fall shortly after harvest is completed. Tip rapidly growing shoots to encourage flowering. Apply a balanced fertilizer, such as 6-6-6, quarterly. In the 12 Trees Project, under conditions of above-average initial soil fertility, one-year-old trees received 1⁄2 pound yearly; two-year-old trees received 1 pound yearly. Where soil fertility is not above average, these amounts can be doubled. An additional pound per year of growth until 5 pounds is reached is recommended. In producing orchards, various N-P-K formulations are used, depending on the soil nutrient status. Cherimoya usually requires extra potassium for good production, up to 10 pounds per year for mature trees. Leaf yellowing can be an indication of the soil being too wet or too dry, or it can be caused by rapid temperature changes, nutrient deficiencies, or soil pH below 5.5 or above 6.5. Cherimoya usually does not ordinarily yield heavily in Hawai‘i. Its flowers contain both male and female organs, but they mature at different times. In major cherimoya growing areas in New Zealand and California, hand-pollination or a pollination gun is used to ensure good fruit set and result in fruits that are more uniform in size. Pollination needs to be done when the female flowers are receptive, over a 6–8 hour period. Pollen is collected in the afternoon from partially opened flowers and transferred by brush to the stigmas of female-stage flowers, either just after collection or the following morning (with pollen refrigerated overnight). This process is usually repeated for 4 or 5 days during peak flowering. Observations in South Kona revealed that when the often-flowering soursop (Annona muricata) is planted among cherimoya trees, the cherimoya produces more fruit than in locations where soursop is not planted, possibly because more pollinators are attracted to the area. In Hawai‘i, cherimoya cultivars are often grafted onto seedling rootstocks of cherimoya or another annonaceousfruit such as soursop (A. muricata), pond apple (A. glabra) or custard apple (A. reticulata). 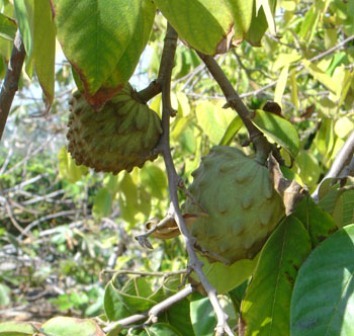 The sugar apple (A. squamosa) is used as a rootstock in other locations where the cherimoya is grown, but it has not adapted well to Hawai‘i. Airlayers and cuttings are not very successful ways to propagate the tree. Seeds can remain viable for up to two years. Soursop rootstock is commonly used in the Kona district, often with one soursop vertical remaining so that the tree will be more attractive to insect pollinators (and also produce both types of fruit). 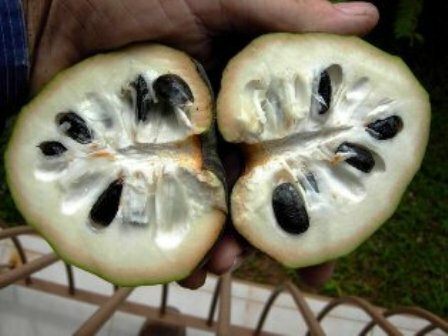 The annona seed wasp(Bephratelloides cubensis), first reported in Hawai‘i in 1986, has caused extensive damage to both commercial and backyard growers on O‘ahu and the Big Island. The insect tunnels through the fruit after devouring the seed as larvae. The emergence holes on the developing and ripening fruits may cause rapid decay and easy access for ants and other insects attracted to the fruit. Infested fruit needs to be removed from the orchard to reduce breeding grounds and prevent reinfestation. Using protective wrapping (fruit bags) after fruit set will also prevent damage from the insect. Cherimoya is also susceptible to anthracnose (Colletotrichum gloeosporioides), which appears as dark spots that can produce pink spores. Black canker (Phomopsis anonacearum), which appears as hard or cracked purple spots on the surface, is also a problem. Botryodiplodia rot (Botryodiplodia theobroma) causes the flesh to become brown and corky. These diseases can be minimized with good field sanitation practices and approved fungicides. Yields vary greatly depending on pollination practices. Five-year-old trees that have not been artificially pollinated can produce 25 or more fruits per season. Thirty year-old trees in Italy have produced up to 300 fruits. Hand pollination tests in New Zealand produced up to 100 fruits per tree. Timing of harvest is crucial, and care must be taken with harvested fruit. If picked too early, the fruit will not ripen properly and will become mealy. Overripe fruit can split, resulting in rapid decay. Harvested fruit for wholesale markets are generally sized and packaged in single layers to prevent bruising. Ripe fruit should be kept at 32–41°F. Stores selling unripe cherimoya often put them in chilled sections of the produce department, which will prevent the fruit from ripening. Unripe fruit should not be chilled and should keptat 68–73°F. It can be stored at 50–55°F with 90–95% relative humidity for two to three weeks. In Hawai‘i, cherimoya is sold by weight; 2005 wholesale prices ranged from $1.50 to $2.50 per pound, while retail farmer’s market prices were as high as $5.95 per pound. In some retail locations, individual fruits are placed inside foam netting to prevent bruising. The seeds of cherimoya contain several alkaloid(anonaine, liriodenine, and lanuginosine) that should be considered poisonous. In some places the seeds are crushed and used as insecticide.